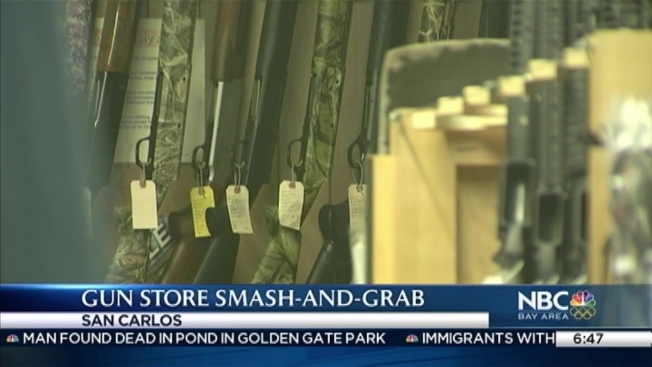 San Mateo County Sheriff’s deputies are looking for three unknown suspects who they say broke into a San Carlos gun store and made off with “numerous” weapons. Det. Salvador Zuno said the burglary was reported Sunday about 5:20 a.m. at Imbert and Smithers located at 1144 El Camino Real. Sunday is the only day that the store is closed. When deputies arrived within two minutes of being dispatched, Zuno said that they found the front of the store had been smashed by a black 4-door sedan, later seen in surveillance footage. The suspects then fled in the vehicle in an unknown direction.